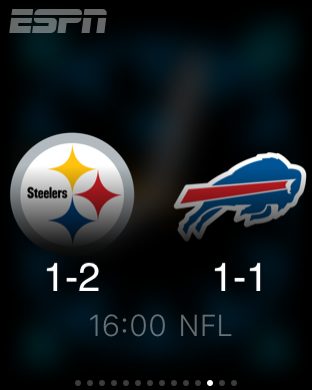 As I sit back in the office at work and check a text on my apple watch I remember for a split second just how awesome this gadget is. Lets go back a little ways to April 10th at 3:01 am; it seems not that long ago but in reality its been 120 days! That was the night that the apple watch preorders started online, and i was ready with laptop open, cup of tea and a credit card. What I didn’t know that night was how much of an impact this device would truly have on my day-to-day life. I am an apple fanatic so when another product was announced the excitement inside of me was instant, even if I wasn’t sure how much practicality or use this new device would give me in my life. What are complications? 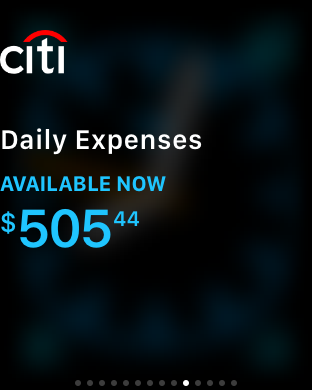 these are the little bits of information on the watch face that provide up to the second instant information such as temperature, calories burned, upcoming calendar events, stock prices, etc. These elements of the watch face tend to be customizable to show users more or less information depending on user preferences. These are constantly available and always being updated to keep you in the know to the things that really matter. 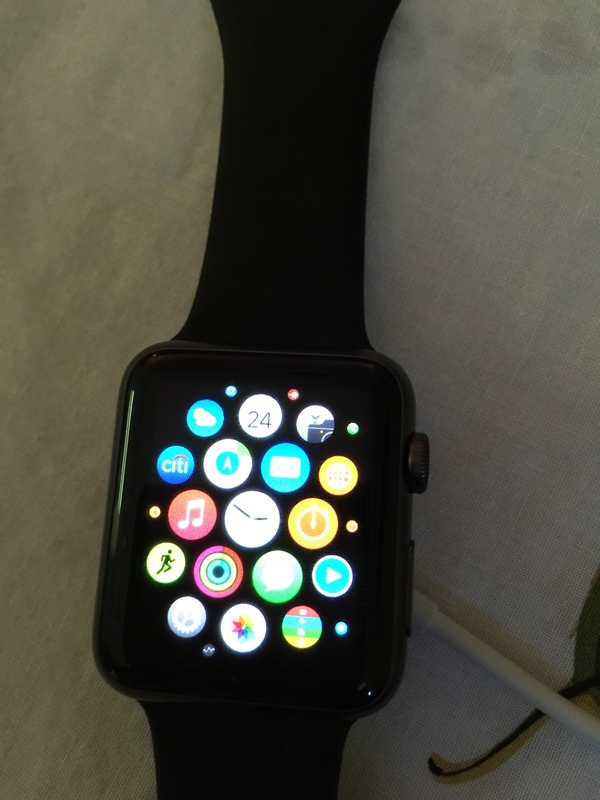 In addition the red dot at the top of the screen on watch lets you know you have notifications that need to be viewed. 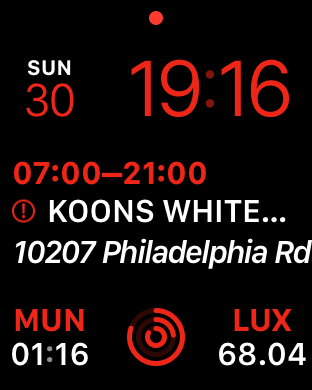 In my watch screenshot i have todays date and day of the week, next event on the calendar, time for Munich, activity tracker and Luxottica’s current stock price. 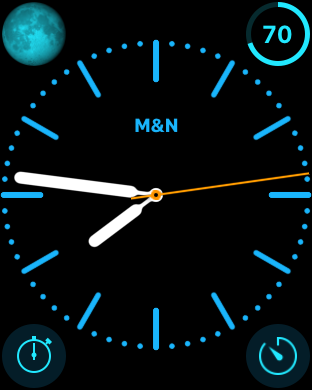 In this screenshot the complications used are for moon phase, battery level, stop watch, and timer. So just how useful is this thing is the question most people have had since this product was announced , and I am here today to tell you that for me its an invaluable tool everyday for the quickness that it lets me gain access to the information that I want to see. This may sound so basic and simple but in reality does a person read the whole newspaper or just the parts that appeal to them? For those that read the whole paper and are not sure what parts will be most interesting to them then the watch may not fully satisfy their news, notification, reading, texting appetite. Those users demand a bigger screen and more features because they are going to be looking at the screen too long for the quick glances of information offered by the apple watch to be enough. The other portion of readers know just what they want to do (i.e. check bank account balance, check sports score, read a quick text, check heart rate, use apple pay etc) this watch is perfect. The glances of information that the apple watch gives you are very specific to your own taste and personal preferences; these include your favorite team, closest Starbucks, calories burned, directions, and much more. These glances provide information that you want quickly without needing to grab your phone. Only downside is those users craving more information will need to use iPhone. New update in the wings coming this fall to apple watch with added watch faces, new complications, more powerful siri, and numerous amounts of tweaks and enhancements the apple watch will only get more useful. 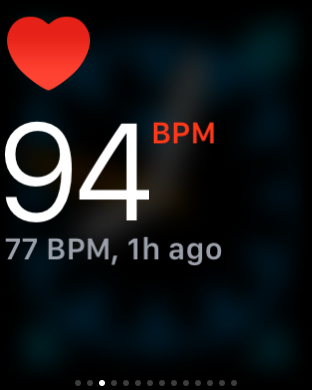 The promise of getting instant notifications, activity tracking, siri, apple pay on my wrist was a lot to promise but for the most part apple delivered on all fronts. This watch has been not only a useful piece of technology but a good-looking accessory for all occasions. The watch offers so many different ways to customize its screen, watch band, and material made from that it’s not likely you will see the exact same one you are wearing on someone else’s wrist . 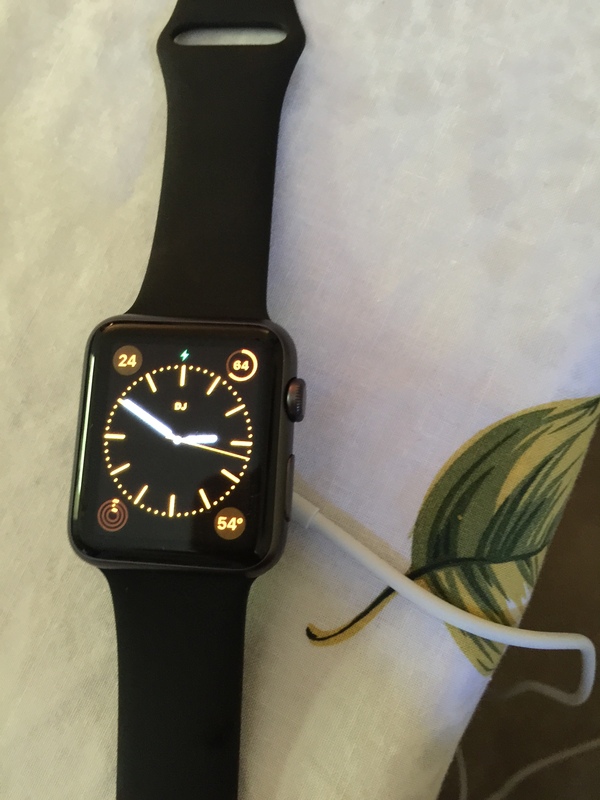 One last thing to remember this is not an iPhone replacement but more of an iPhone companion; and with that mindset in place people will be able to approach the idea of getting an apple watch with realistic expectations.